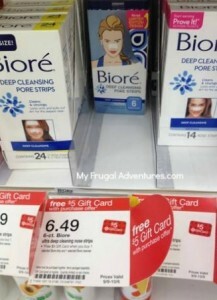 Here is a really nice deal on Biore products at Target this week. This is an unadvertised deal so you may not find the same thing at your store but certainly worth checking out! Buy 2 Biore products and get a $5 gift card (through 10/8). Final Price: $1.49 for 2 or $.75 per item! That is an excellent price and there was a recent home mailer from Target with a $1/1 Biore coupon inside. If you happened to get that booklet, your deal is $.25 per item! You can see the rest of this week’s Target deals here. I did this deal yesterday and bogo coupon takes off $6.49. It is a great price for these products.